The legend returns! 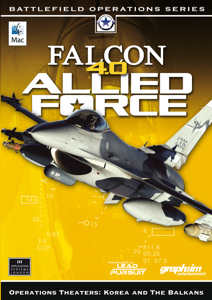 Falcon 4.0: Allied Force is the most comprehensive and powerful combat flight simulator ever made for non-military use. It's just like sitting in the real cockpit. Features incredible attention to accuracy and simulation fidelity. Enhanced with new features and a new theater of operations covering the Balkans and Korean Peninsula. Pilot three different variants of the F-16 Fighting Falcon. Shoot a variety of air-to-air missiles like the AIM-120 AMRAAM and AIM-9 Sidewinder. Simulate an entire war with the most advanced and truly dynamic campaign engine ever made for your PC. Participate in cooperative or adversarial multi-player flight over a LAN or internet. Bomb damage may or may not be repaired, depending on enemy resources and command.